This prototype Toshiba PMP runs on methanol alone and will go on sale next year. Yes, we know we've been banging on about fuel cells since what seems like the dawn of time, but - after the recent news that they're edging ever closer - here's a real product that we've actually seen working. 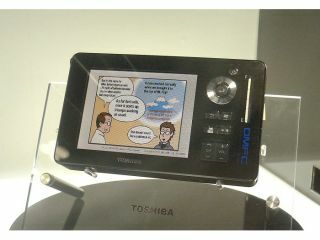 The newest addition to Toshiba's Gigabeat line of portable media players is currently on display at CEATEC in Japan and features a direct methanol fuel cell (DMFC) that Tosh claims is safe and 100 per cent ready to go on sale. Although it is still being called a prototype, the company says the DMFC player will go on sale next year. The move is partly because engineers have perfected the fuel-cell technology and partly because airlines have agreed to allow the cells on planes when they hit the market. As for the technology, the player can play audio, video or digital TV for up to ten hours using just 10ml of methanol. To address safety issues, the fuel tank is filled using a sealed cartridge that eliminates the possibility of spilling the volatile liquid. Given all that, we confidently predict that the first fuel-cell gadget you'll be able to buy will indeed by this very Gigabeat - remember where you heard it first.